I have news, good news, and great news today, all about about Atlanta musician Morgan Shaughnessy. First, the news. 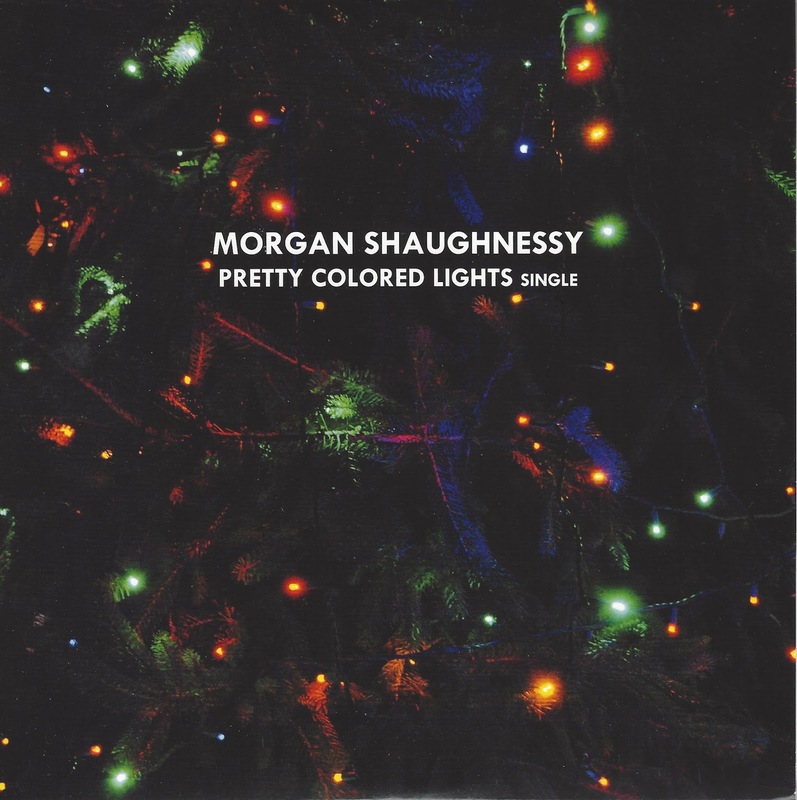 Our friend Stubby has written a terrific post about the release on vinyl of Morgan's Christmas single "Pretty Colored Lights". His post is here, and as always Stubby has written up a mighty fine story about Morgan, about "Pretty Colored Lights" and the b-side, an instrumental version of "February Moon", and the limited-edition colored vinyl release of the record. Go to Stubby's and read up. My personal addition is that "Pretty Colored Lights" has a truly unique, enveloping, almost supernatural musicality to it. Morgan's layering of the instruments with her vocals is tantalizing. It's fresh, ethereal, and totally Christmassy. Now the good news. Morgan has answered a series of short questions to let Merry & Bright readers get to know her better as a musician and a person. It's a fun short-answer Q&A format, following below. Many thanks to Morgan for playing along. You as a reader will come away knowing a lot more about this fine young artist. Actually, I think the Q&A is pretty great news, so we'll call it Great News One, and here is Great News Two. 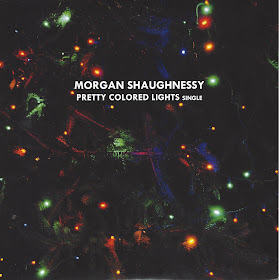 I'll be doing a giveaway of two copies of Morgan's "Pretty Colored Lights" limited edition vinyl! Free Christmas Music! Free Vinyl! You'll have to stay tuned here at Merry & Bright for the details - look for it around Dec 6 or 7. As always, there will be a teeny, small entry criterion where you'll provide info from Morgan's website. But that's it - quick and easy. Stay tuned. And now, without further delay, here is "20 Questions with Morgan Shaughnessy"
1. City of Residence: Atlanta. I live in Atlanta's version of 8-mile - the line between the hood and the mansions. We have to park with our gas caps facing the curb or some 11 year old kids will funnel it while I'm still awake. True story. 3. Favorite Christmas Song: Have Yourself a Merry Little Christmas, because it's morose and realistic but still maintains that hopefulness that things could still improve next year, which is definitely a facet of the Christmas experience that gets less explored than others. 4. Who Should Play You in the Movie About Your Life: Evan Rachel Wood is the only young actress with the emotional range to play my life. Plus she's awesome. 5. Number of Musical Instruments You Play: 6ish. Drums, Guitar, Bass, Piano, Hand Drums, and Violin plus a few miscellaneous ones. 7. Musician Who Inspires You: As far as whole careers, I'm very inspired by the wide variety of things that Sara Bareilles has chosen / gotten to do. Also, the music she writes tends to be on the prettier side, but she keeps the stage banter light and profanity-laced - to which I can relate. I just can't bring myself to be all serious on stage. Even if the songs are serious. It's not natural for me. As far as musically, I have to say I'm most inspired by the band Sublime-- mostly because they played whatever they wanted with no regard to genre whatsoever. I have loved them for my whole life! 8. One Thing That Makes You Happy: I enjoy physical affection. 9. Interesting Fact About You: I have dated somebody who was on a reality show, and it was weird. 11. First Solo Musical Performance: At a place called Dark Horse Tavern with a handsy technician that my brother had to threaten. 12. Musician/Band That Everyone Should Listen To: Jason Mraz, it's the musical equivalent of smoking a joint. Everybody would be so chill. 16. Favorite Place to Perform Live Music: Huge fields full of people. 17. Why You Wrote and Recorded a Christmas Song: The holidays are a really tricky time in the music industry. To be honest, I recorded it to try to bridge that gap created by releasing my EP during the holidays and make it go down smooth. But also, I have had that song written for years and years because I love the Christmas season, particularly the music, so I was definitely excited to get a chance to actually record and release the song. It's so great to have it actually, finally exist! 18. Cat or Dog? I think cats are mystical felines who walk between worlds, but I hang out with dogs. 20. Message to Your Fans: You're in charge of your own life, you can decide your own priorities and they don't have to look like anybody else's. Be kind to the beings around you. Preserve the earth. Be free and have fun – it's your life, and we're also at a point in history where we can make a big difference by saying no. Sing, even if you're not "good" at it.